Smoked salmon is one of my favorite foods, bar none. I’ll use almost any excuse to eat it, whether it’s by itself, on a bagel, or in a sandwich or salad. When I found out that you can smoke your own salmon, I was ecstatic. My joy carried over for several weeks after my discovery. Not only was my home-smoked salmon better tasting than the stuff I bought at the store, it was also a bit cheaper. 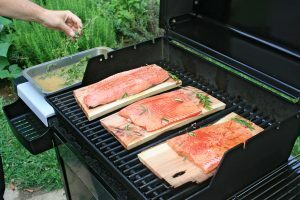 In order to enjoy home-smoked salmon yourself (and you really owe it to yourself to try it), you’ll need a fish smoker. Luckily, fish smokers these days are rather affordable and easy to use. 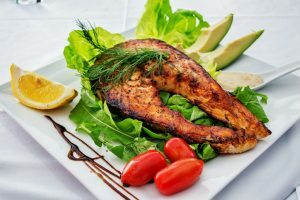 On this page, we’ll go over everything you need to know about smokers and talk about the best options on the market for smoking your own fish. This little tube is the best and cheapest way for anyone who’s interested in smoking to try it. This unit is incredibly easy to use so it's perfect for casual backyard use. While it’s more expensive to purchase and operate, it’s a fantastic device for any barbecue enthusiast. 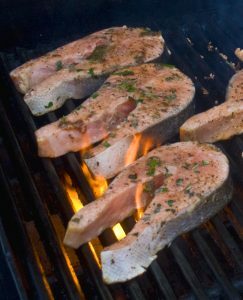 Is Smoking Fish Different Than Smoking Meat? Smoking fish is pretty similar to smoking meat. Well, mostly. Fish tends to come in a different form factor than a big ol’ pig roast, you often smoke it at different temperatures, and you usually use a different type of wood. Other than that, however, it’s quite similar. This means that a top meat smoker can smoke fish quite well (and vice versa). You’re primarily concerned with differences in how the interior volume is divided. For fish, you usually want lots of shallow racks, while you want a smaller number of deep racks if you’re smoking big meats. Most modern smokers have a good enough mix that you can do both, and some even sell additional racks that specialize in one type of food. Smokers work by applying low heat to your food for a long time. They’ll also set up an environment where flavorful wood smoke can condense onto your food, giving it a trademark smoky flavor. You want your smoker to efficiently do both of these things without any intervention from you. This means that the most important thing you should look for is reliable, automatic temperature control. Try to find a pellet smoker, electric smoker, or a gas smoker with a built-in thermostat. All three of these smoker types will automatically regulate their heat levels to try to stay at your desired temperature. Beyond that, look for a smoker that’s well-sealed. You don’t necessarily need a totally airtight device, but you want to make sure that the smoke stays inside the smoker and doesn’t just fly out of a hole in the side. A good smoker is thick and heavy. It should look and feel sturdy. Another important quality to consider is size. A smoker needs to be big enough to smoke everything you want to smoke. Unfortunately, bigger smokers are more expensive. This means that you’ll have to strike a balance between size and price. 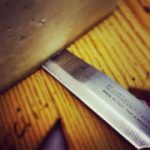 If you plan to use your smoker quite often, it’s probably a good idea to spend a few extra dollars and get a few extra inches in each dimension. Remember that area is the product of three dimensions. Increasing all 3 by 25% will just about double the volume of a smoker. If you want to smoke more things than just fish, pay close attention to the temperature range each smoker can hit. You usually don’t go above 250 for smoking meats, but some people like being able to straight up cook food in their smoker as well. This means internal temperatures of 325 or higher. Does Smoking Fish On An Electric Smoker Work As Well As Other Smokers? The answer to this one is slightly more complicated than you think. No, electric smokers will give you a slightly worse taste, in theory. The actual process of burning wood is key to smoking food properly, so a true wood smoker will give you the best, strongest, and most authentic results. Does this mean you shouldn’t buy an electric smoker? No. I’d actually recommend an electric smoker to most people since it’ll give them better-tasting food. While the above answer is true (electric smokers are worse in theory), electric smokers are significantly easier to use than other types of smokers, so you’ll get better results out of an electric smoker than a wood smoker unless you’re a competition chef. In fact, electric and gas smokers are so consistent and easy to use that they’re banned from most barbecue competitions. Your dinner is not governed by competition rules, however, so you’re totally okay to cheat and use one of these simple tools. Electric smokers (and gas smokers, to some extent) are so powerful because they’re incredibly good at regulating temperatures. If you set your electric or gas smoker to 180 F and walk away, it’ll maintain 180 F no matter what. Wood smokers and even pellet smokers (to some extent) will fluctuate drastically. It takes both attention and skill to maintain even temperatures in these smokers. Remember, consistent temperature control is the most important thing when it comes to smoking food. Okay, so if electric smokers are so great, how hard is it to smoke fish? Here’s a simple recipe for smoked salmon. You can adapt this to other fish as well. Step 1: Brine the fish. Some people do this in a water bath. My favorite method is to simply dry brine the fish by covering it with a generous mixture of salt and sugar, wrapping it in plastic or foil, and putting a phone book on top. Use about 1:1 salt and sugar and roughly 1/4 cup of each for each large salmon filet you’re dry brining. Once you’ve caked the fish in salt and sugar, let it sit in the fridge for about 12 hours on each side. Be sure to put a plate under the fish to catch any drips. Of course, you can use a wet brine instead if you prefer. Simply put the fish in a glass container, cover with water, and mix in about the same amount of salt and sugar you’d use for a dry brine. Let the fish sit in this brine for up to two days, depending on what kind of fish you’re brining. Step 2: Remove the fish from the brining solution and pat it dry with paper towels. Let it sit out somewhere cold for an hour or three until the surface is dry to the touch. The refrigerator will NOT work for this – air movement is key. Fans will help speed up the process. You need your fish to develop a hard, smooth outer layer for the smoke to stick to. Step 3: Smoke! You want to throw your fish into your smoker until it hits an internal temperature of 145 to 150 F. Different recipes use different heat levels and amounts of time to achieve this. My favorite is to simply set the smoker to 160 F or so and let it take as long as it wants. There’s very little danger of me accidentally overcooking the fish this way. It also helps a strong, smoky flavor develop. If you’re in a hurry, you can set your smoker as high as 250 F and get the job done in as little as 1 hour. Step 4: Eat your fish! If you don’t eat smoked salmon right away, be sure to wrap it up tightly in plastic or foil and refrigerate it. It should keep for several days. This isn’t technically a smoker on its own. What it is, however, is brilliant. It’s a tube that you can load up with wood pellets or chips and throw into any old grill or other barbeque apparatus. You then light it and sit back as it provides smoke and turns your grill into a bona-fide smoker. It also works with actual smokers to really amp up the smoke levels and give you extra rich flavors. Now, this device doesn’t do any of the things you need a smoker to do. It doesn’t control temperatures. It doesn’t seal in smoke, It doesn’t even have a rack for you to put food on. It does, however, work very well when it’s paired with a device that does all of those things. If you want to try making smoker fish at home for the first time, this little tube is the best and cheapest way to do that. 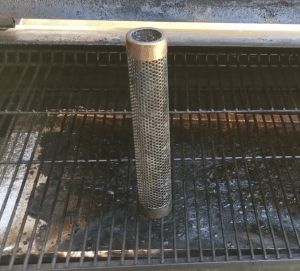 You can just slap it in your barbeque and use charcoal or gas to control the temperature while this gizmo provides smoke flavor. When you graduate to a full-sized smoker of your own, you can still use this tube to add an additional source of smoke to help keep things flavorful. I would absolutely recommend this device to anyone who’s interested in smoking. There are practically no downsides, and just about everyone will get some use out of it. I mentioned above that I think that electric smokers are the best kind for casual backyard use. 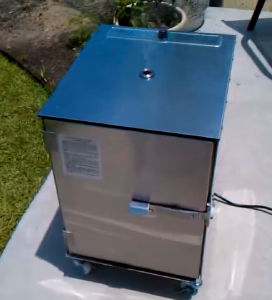 This is a very well designed backyard smoker that has all of the features you want. It’s got a powerful heating element that’s fully controllable, it’s got a fairly generous interior compartment while remaining affordable, and it’s made of thick stainless steel for extra durability. Best of all, it’s got wheels and handles to make it easier to store in your backyard. Importantly, this unit is incredibly easy to use. You plug it in, throw in some wood, turn it on, and set a temperature. Then, you’re done! That’s really it. After you’ve done that, all you need to do is wait for your food to be done. The combination of these key factors makes this my favorite smoker overall. It’s really quite hard to beat! Pellet grills like this one give you a more “authentic” smoking experience. Unlike with electric or gas smokers, most of the heat is actually generated from burning wood, rather than a heating element or a propane fire. This gives you a slightly richer, more smoky flavor. This type of machine is not without downsides. It’s big, expensive, and less good at controlling heat than the other types of smokers. On the other hand, it’s still capable of controlling heat somewhat by controlling the flow of fuel into the burn area and modulating airflow. 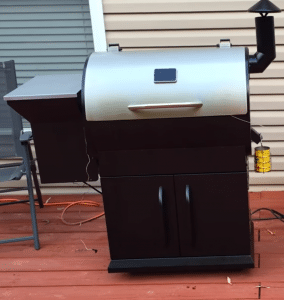 This machine is a fully serviceable grill as well as a wonderfully effective smoker. While it’s more expensive to purchase and operate (due to the cost of pellets), it’s a fantastic device for any barbecue enthusiast. I think that quality electric smokers (like the Smokin-it I recommend here) are the best way to smoke food at home. They’re easy to use, they don’t use much fuel, and they don’t leave any kerosene or propane residue on your food. 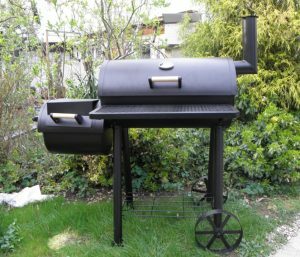 The Smokin-It model here is an incredibly affordable restaurant quality smoker that you can easily fit in your backyard. It’s simple to operate and the reliable temperature controls get you the exact results you want every time. If you want to smoke fish, it’s probably the best way to do it. Of course, other options exist! 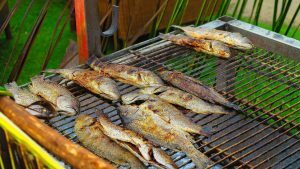 Both the cheap pellet tube add on and the full sized pellet smoker here are excellent ways to give your fish an authentic, smoky flavor. If you have a grill already or you want a genuine piece of barbecue equipment that uses real wood fire as its primary heat source, these options work great too.